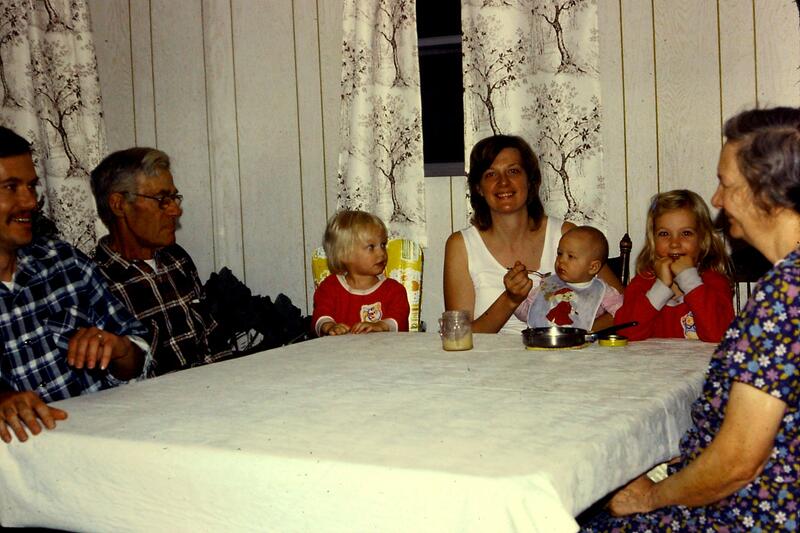 A family meal at our grandparents’ – it may have been Thanksgiving, but Wendy seems to be the only person who is getting any food! Thanksgiving is tomorrow. A lot of people are making pies today. Pie making can be a lot of fun, but it can also be a lot of work. I have a friend named Miss Ginny. 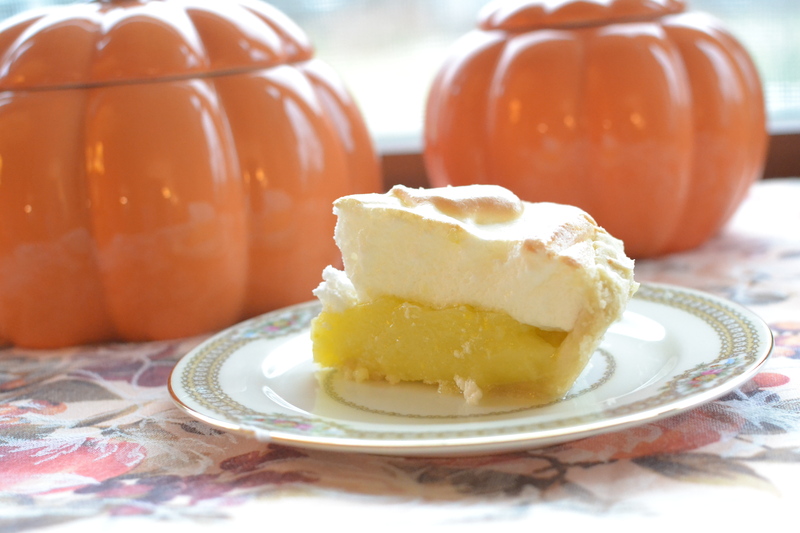 She is a wonderful person and she can also make the most wonderful lemon meringue pies. I am impressed by her skills, but I have never attempted to replicate her creations . 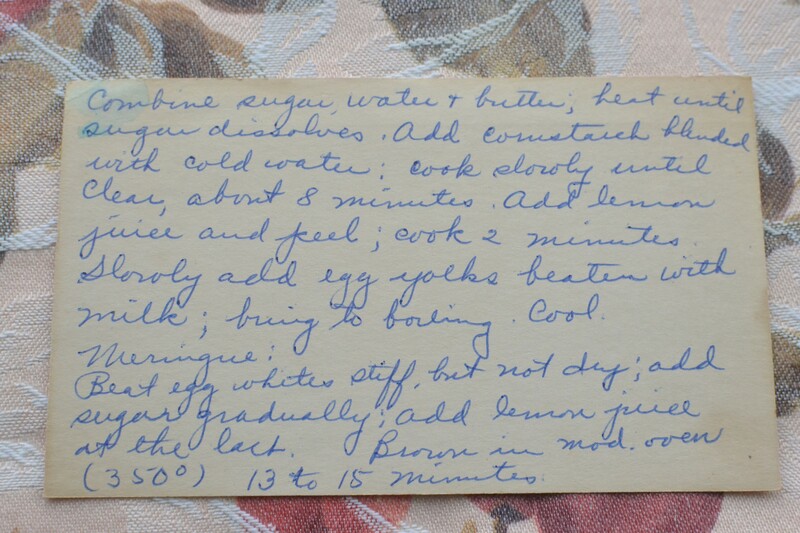 . . until I found this recipe of my grandmother’s. I needed to make a pie for the Thanksgiving and Pie Night service at church. I found this recipe and realized I had all of the ingredients. I’ve always been a little intimidated by lemon meringue, but I decided I would step up and give it a try. 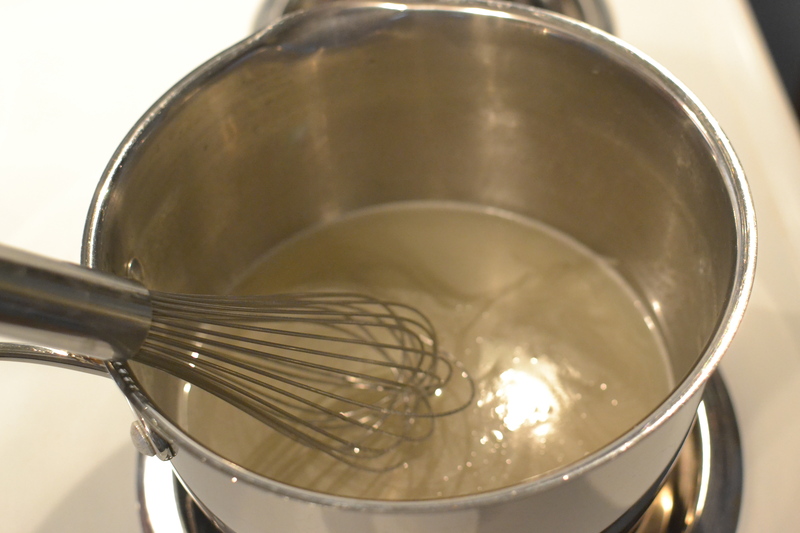 Combine sugar, water and butter; heat until sugar dissolves. 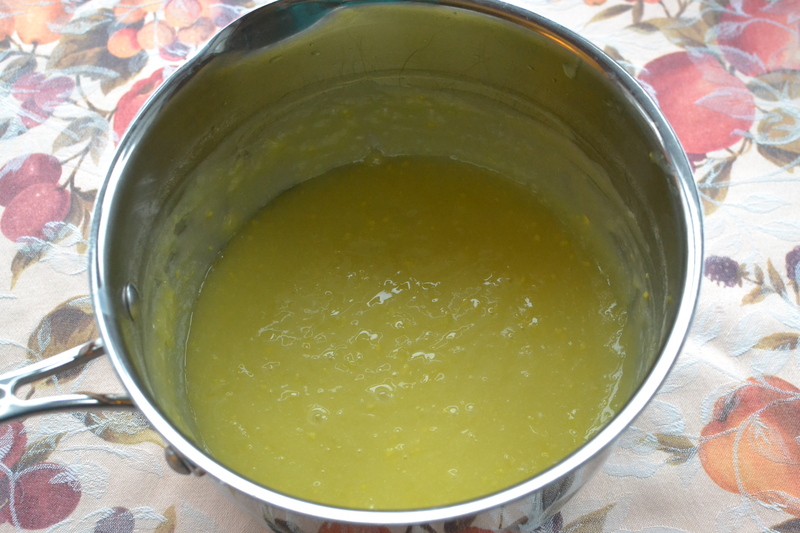 Add cornstarch blended with cold water: cook slowly until clear, about 8 minutes. Add lemon juice and peel; cook 2 minutes. 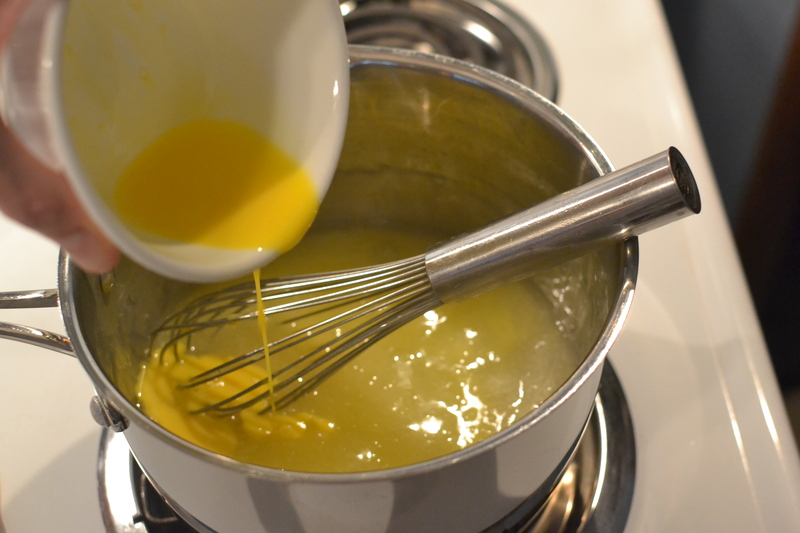 Slowly add egg yolks beaten with milk; bring to boiling. Cool. 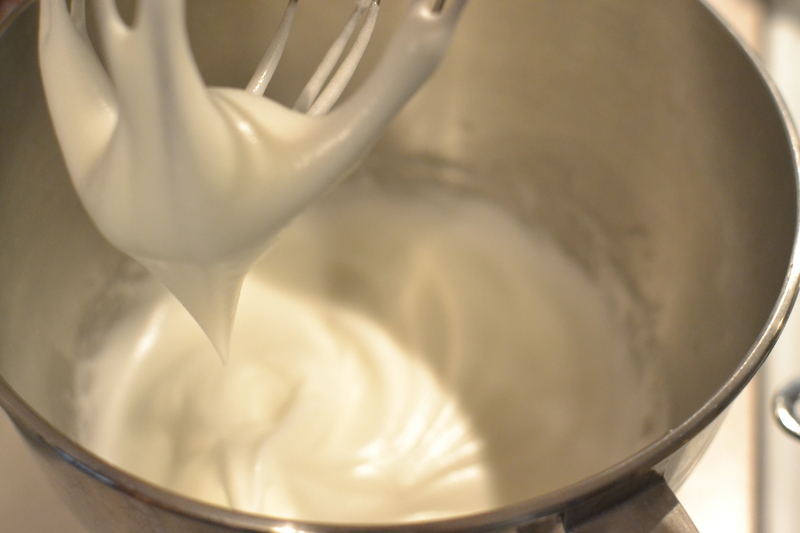 Meringue: Beat egg whites stiff, but not dry: add sugar gradually; add lemon juice at the last. Brown in moderate oven (350 degrees) 13 to 15 minutes. First I made an 8 inch pie crust. 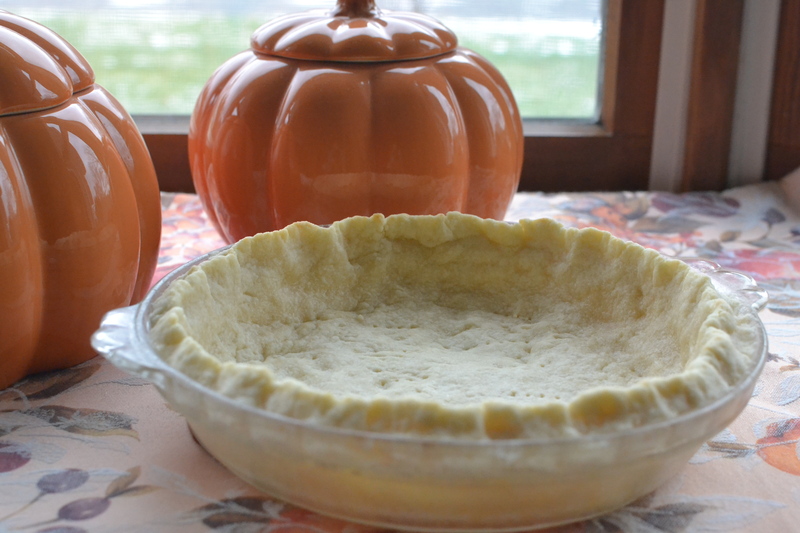 (Well, actually, I first made a 9 inch pie crust, then realized this recipe needs and 8 inch, so I had to make another one. At least it is a quick and easy recipe!) I used the easy pat-in crust that Wendy used for her chocolate pudding pie. 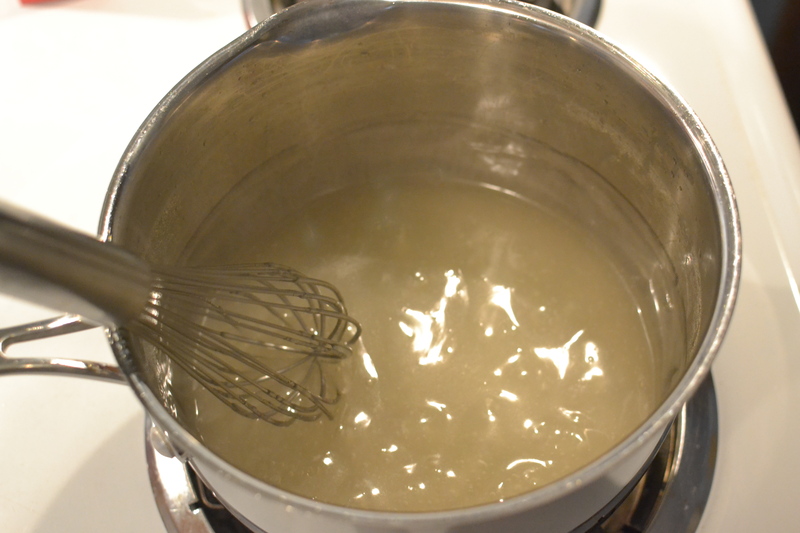 While that was cooling, I combined the sugar, water and butter and heated until the sugar dissolved. Not too hard so far! I then mixed the cold water and cornstarch together. I have a cup with a lid, so I put the cornstarch and water in the cup, put the lid on and shook them up. A whisk would have worked as well. 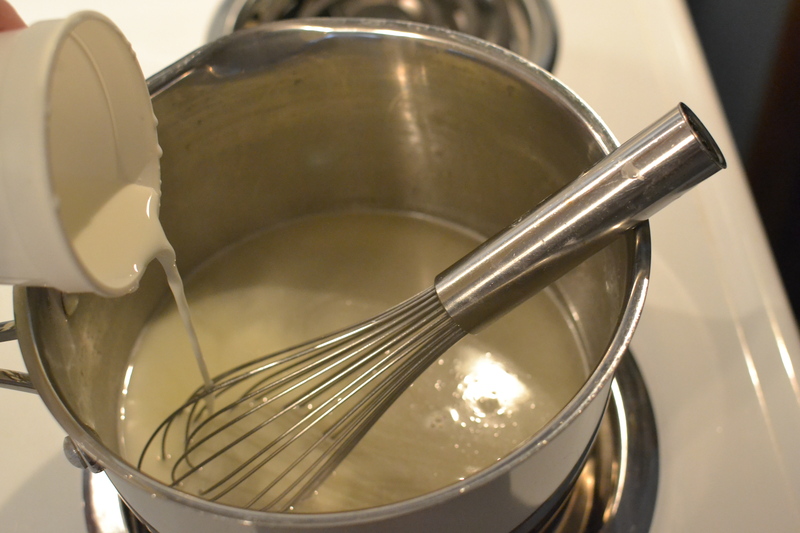 I added the cornstarch, water mixture to the sugar, water and butter mixture and set the timer for 8 minutes. After 8 minutes I thought it looked pretty clear – so far, so good. I then added the lemon juice. I didn’t have any lemon peel on hand, so I used about a quarter teaspoon of lemon extract instead. I cooked all of this for 2 minutes. I was starting to think I could do this! Then, came the trickier part. I separated the egg yolks from the whites and mixed the egg yolks with the milk. 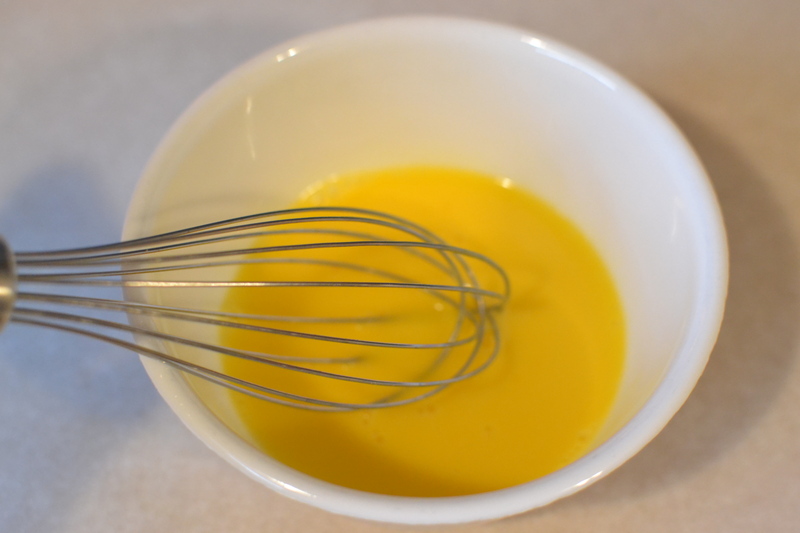 When I slowly added the egg yolks and milk to the mixture, I think I may have added a little too slowly (or stirred a little too slowly or something) because the mixture got a little lumpy. I whisked wildly trying to get the lumps out, but some of the smaller ones remained. Oh well. 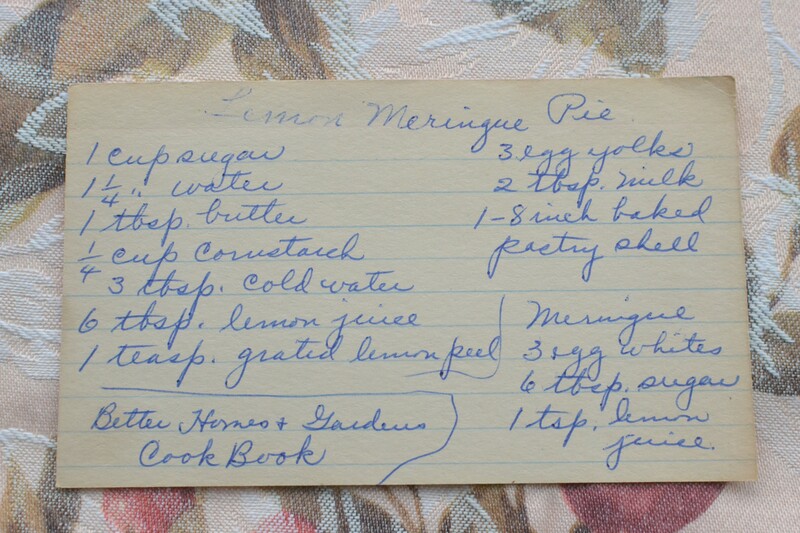 I reminded myself I was a novice with lemon meringue pies and kept going. 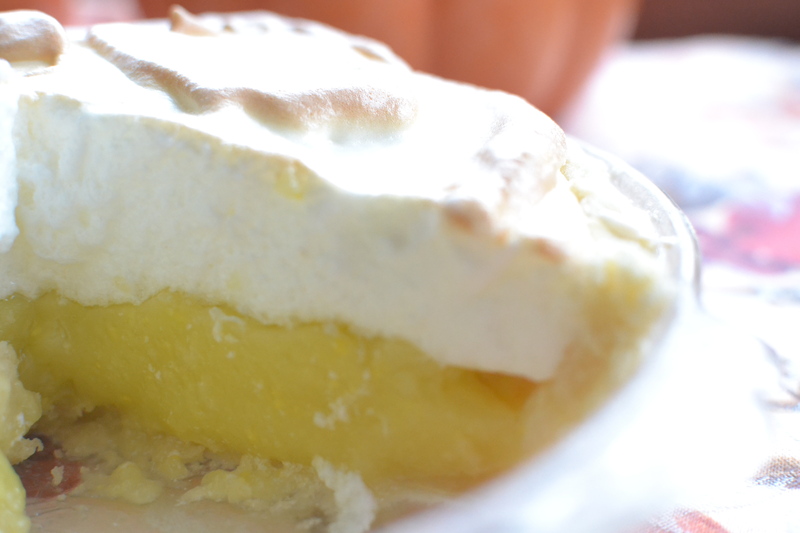 The lemon filling – please say you don’t see any lumps! I brought the mixture to a boil and then set it aside to cool. It did look a nice yellow color. I tried not to notice the tiny lumps. Next I made the meringue. Could I do this part? I wasn’t sure, but I was going to give it my best shot. 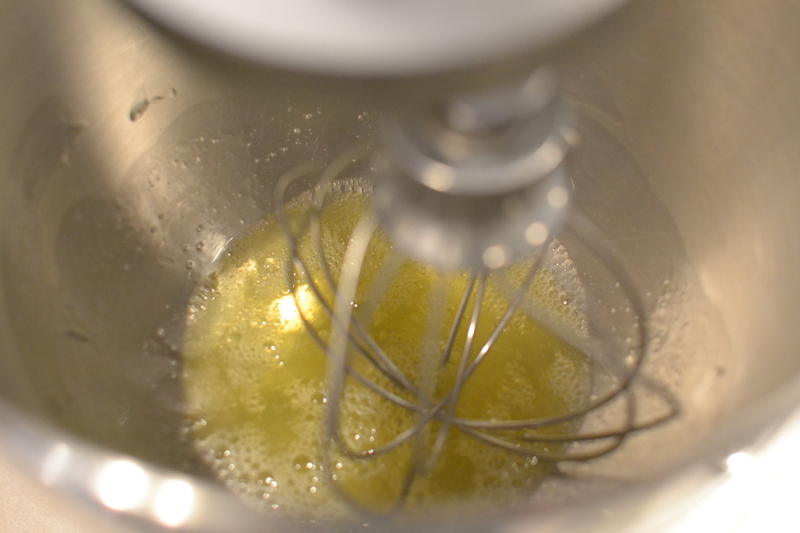 I put the egg whites in the Kitchenaid and started whisking them. I wasn’t too sure what stiff, but not dry meant, but when I thought I was to that point, I added the sugar and then lastly the lemon juice. The meringue looked beautiful. “Okay, that part went well.” I told myself. 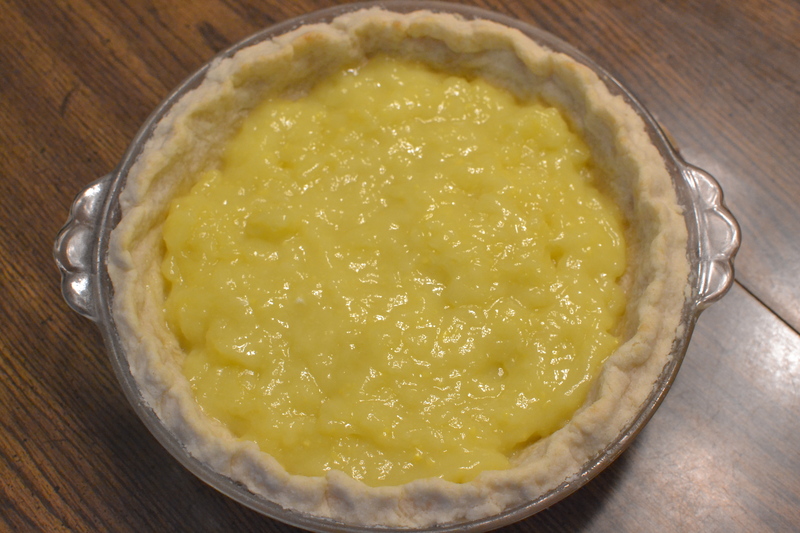 I put the lemon filling in the bottom of the 8 inch crust. 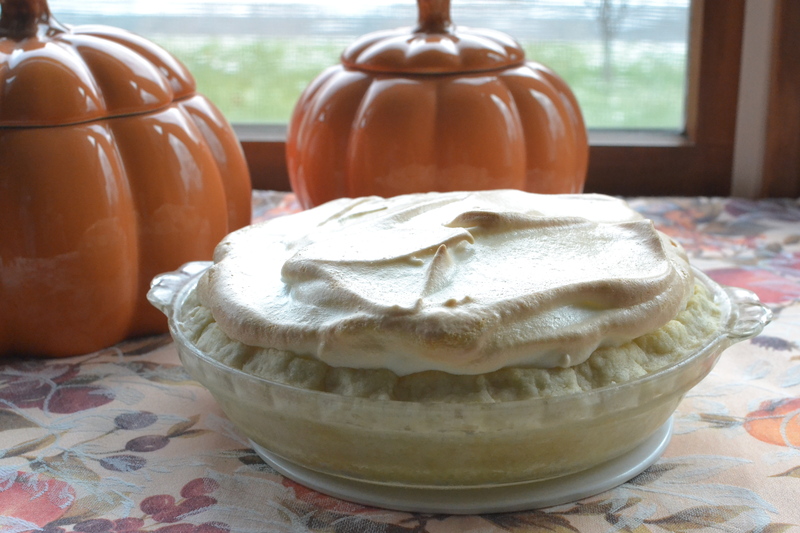 Then, I put the meringue on top. I thought that in the end, it probably could have used a 9 inch crust (I should have just stuck with my original crust – oh well! ), so I noted that for next time. I then baked it in the oven for 15 minutes and, guess what? 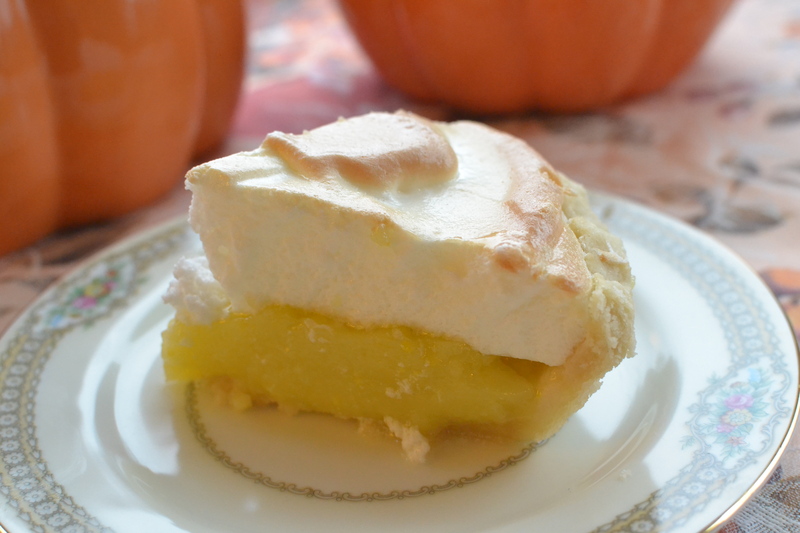 It looked like a lemon meringue pie when it came out! How did I do that (Don’t think about the tiny lumps! Don’t think about the tiny lumps!)? When I cut a piece I couldn’t see any lumps! It was beautiful! I impressed myself! It definitely has a subtle lemon flavor. If you like it more lemony, you would want to add more lemon peel. My dad thought it was great and I liked it too (my mom thought it needed more lemon!). So, even though I had a few moments where I thought all was lost, in the end I actually made a lemon meringue pie! I think my grandmother would have been happy with my work (and I know Miss Ginny would enjoy hearing about it too – maybe I’ll have to call her and tell her about it sometime). Happy Baking and Happy Thanksgiving! 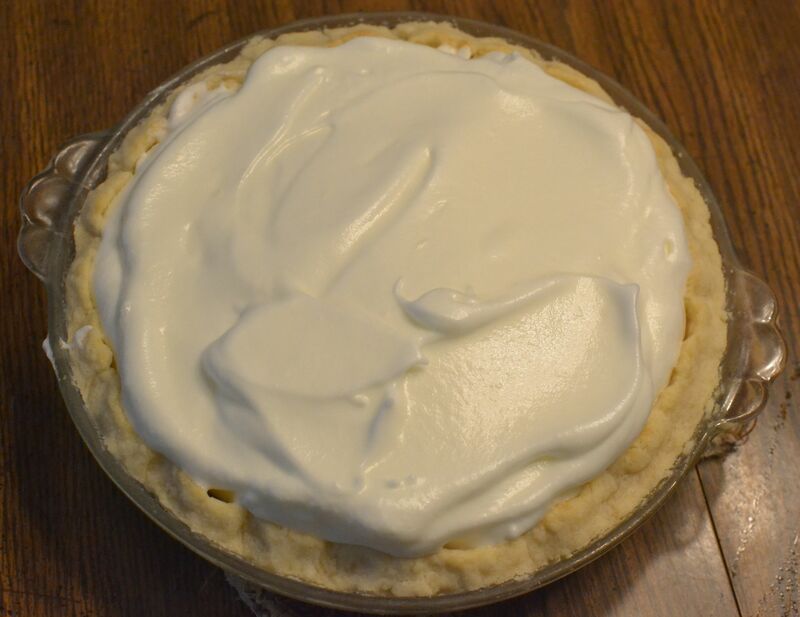 This entry was posted in Dessert, Pies and tagged baking, dessert, farm cooking, grandma's cooking, homemade, lemon dessert, Lemon Meringue Pie, lemon pie, Meringue, Pie, scratch cooking by GrandmothersRecipeBox. Bookmark the permalink. Thanks Arielle! If you whip it up, let us know how it turns out. It was so much easier than I expected it to be! This looks really yummy, thanks for the recipe! I’m a lemon fan too! I hope you enjoy it!